Tickets are now on sale for this year’s annual Warwick Town Bonfire on Sat Nov 3rd at Warwick racecourse. Organisers Warwick Lions and Warwick Rotary Club have worked with Andre Klein, manager at Warwick Racecourse to make some changes and expand the event. Gates will now open at 4.30 pm to allow more time for children to enjoy a small funfair on St Mary’s car park in Hampton Road. 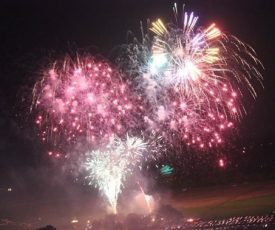 The racecourse is also offering a Bonfire supper upstairs with a view of the firework show. As usual there will be lots of hot food to buy, all the bars will open, and a steel band will provide entertainment. The racecourse grandstands offer a great view of the Bonfire and Firework show across the track on the common. There will be a short 5-minute display at 6pm to keep the children entertained, with the main firework show after the fire is lit at 6.30. The racecourse is doing the on-line ticketing, and stewarding, with advance tickets also available in local shops in town from October. Entry is at the main entrance off Bread & Meat Close, with free parking, access also off Hampton Road to the show and funfair. Advance tickets – Adults and children over 15 – £7; children under 15 £1; On the gate adults and children over 15 £8; children 15 and under £2; infants under 3yrs old free, so it’s worth buying early. On-line sales are now open at warwick.thejockeyclub.co.uk/ events, and in October from Torrys in West Street; the main Post Office; Claridges; Cabin News; Mellors; Warwick vacuum shop; and the Tourist Information Centres in Warwick and Leamington; as well as Woodloes Post Office; and The Larder Box Cafe at Chase Meadows. Further info .www.warwicktownbonfire.co.uk. Bovis Homes and Uniparts Logistics are supporting the event and organisers are hoping to exceed last year’s record crowds which raised over £26,000 for local charities and good causes.